Con Herbert and local musicians. CRY, that amazing organisation that promotes heart health in young people and supports families who have lost loved ones through Sudden Adult Death Syndrome, hosted a CD launch on Saturday evening last in the Ballintemple Inn, Newcastle West. The organisation had been gifted the song “Forever Part of Me” written by local man Tim Collins and sung by Deirdre Scanlan, both of whom are originally from west Limerick and now living in County Clare. The concert was opened by Liam Herlihy (Trustee for CRY) and the Flannery sisters from Rockchapel started the show with a rousing set of polkas and slides. Mickey Dunne and Oliver O’Connell followed with a song and a couple of tunes. Tommy Fegan, Chairman of CRY, and from south Armagh was invited on to the stage to play a very special tune on his Uilleann pipes. Tommy lost his 24- year old son Kevin to Sudden Adult Death Syndrome in 2010. He addressed the audience, acknowledging those people who had suffered the loss of a child and said, “It’s a club that nobody wants to be in.” His great friend and composer, Josephine Keegan wrote a very special lament called “Caoineadh Caoimhín” in honour of Kevin. Tommy’s performance was beautifully moving. 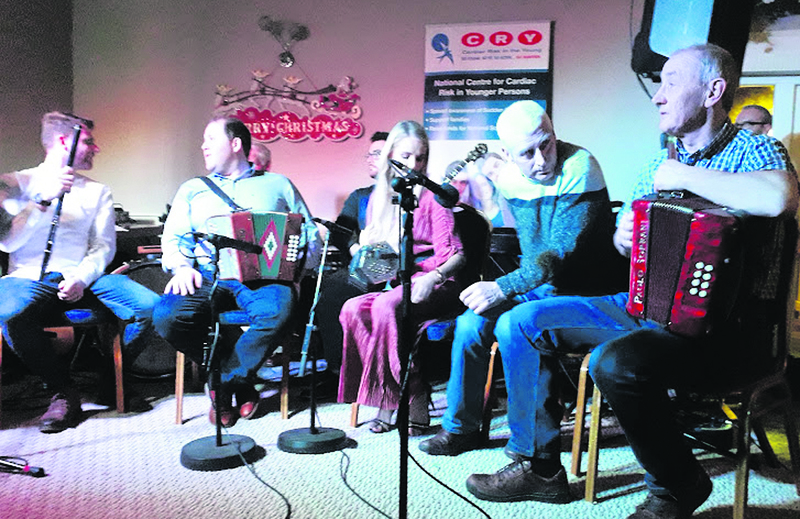 Con Herbert and a group of local musicians from Kileedy and Monagea went on stage to perform a few tunes from the recent Kileedy Wrenboy show that gained the All-Ireland title in Listowel earlier in the year. Liam Herlihy introduced Aaron Gillane, a member of the All Ireland winning Limerick hurling team, who officially launched the CD. Tim Collins spoke about the inspiration behind the song, adding “I donated the recording to CRY Ireland in memory of two young people and former neighbours, who both lost their lives as a result of SADS in recent years, Niamh Herlihy and Darra O’Donovan, nephew of Deirdre Scanlan”. Then he and his team of amazing musicians backed the melodious singing of Deirdre as she gave her rendition of “Forever Part of Me.” It was met with rapturous applause from the crowd who just kept clapping and clapping in appreciation. It struck an emotive chord with everyone. 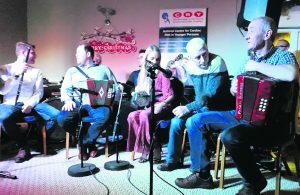 Deirdre proceeded to sing a couple of more songs and finally, after Michael Collins spoke a few words, the full cohort of the Kilfenora Céilí Band, with special guest Donal Lunny, took to the stage. Edel Fox sang another song written by Tim called “Clare my Heart my Home”, and the Limerick/Clare banter was a recurring theme during the night, to everyone’s amusement. Gerard Liston, a local man, had the crowd laughing loudly at his hilarious version of “The Christmas Cake.” At various stages during the concert, the crowd got up to dance on what seemed like only a couple of inches of floor space. The concert finally finished with a selection of tunes from the Kilfenora Céilí Band who were joined by a host of musicians from far and wide. The performance was uplifting and joyous, played by a group of musicians who are second to none. It was truly a magical night, emotions ran high and low, a night out of time that will remain in the memory of all who attended. The CD is available for purchase in all shops in Newcastle West and surrounds, Custy’s in Ennis, Tournafulla Com-haltas Craobh, and is also available for download on the CRY website www.cry.ie. Please support the organisation by buying a gift of a life time, perfect for the season that’s in it.